The School of Business Administration at the University of San Diego was founded in 1972. In its first decade, the school added an MBA program and gained accreditation from the Association to Advance Collegiate Schools of Business (AACSB). The school now offers two MBA programs. 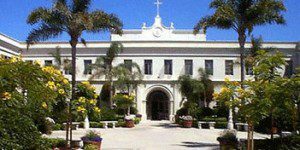 Located near downtown San Diego, the school’s campus covers 180 acres. The school is close to beaches and mountains, and it is about 20 miles from the Mexican border. As well, the school is less than 10 miles away from the San Diego International Airport. The School of Business Administration, as recently reported, has 87 full-time faculty members, of which over 91 percent have doctorate degrees. The faculty has recently published over 116 articles in journals such as Harvard Business School Publishing, Journal of Financial Markets, and the Journal of Consumer Affairs. The average student-faculty ratio is 16:1. Recent figures noted over 1,800 students enrolled in the business school, with roughly 400 in master’s programs. Furthermore, there are around 40 students per cohort enrolled in the full-time MBA program.